Over the last twenty years, my artistic practice has utilized both sculpture and mixed media painting as I have explored concepts of texture, line and mass in relation to visual aesthetics as well as use of recycled metal and other material, re-fabricated or assembled in order to illuminate old Canadian myths and allow new purpose. Past artistic practice has focused on ghostly otherworldly imagery and surrealistic rural Canadian landscapes sublimely infused with multiple layers of textural deviations and has included approximately 240 mixed media paintings and prints, 24 smaller reclaimed metal assemblages, a number of group and solo shows and one public sculpture - mounted in Parkdale in the city of Toronto. Within my paintings and prints, I explore complex variations on texture, color, nuances of form and layering of material to successfully illustrate my ideas and concepts to my viewing audience. I would consider this at least one of my many artistic mandates. 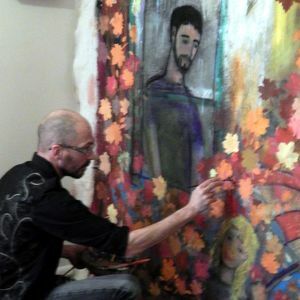 I use social media and public shows to build upon my exposure as a Canadian visual artist as well as involving and engaging the public to become part of the creative process through interaction on social media.